The sounds of wailing have died down in the villages around Kebitigollewa. A few plastic wreaths lie on top of the mass grave, where 67 people lie buried. The place where the jam-packed commuter passenger bus was hit by the explosion shows no signs of the deadly incident that snuffed out so many lives in a few seconds. What remains today are abandoned homes, deserted roads and closed schools. Hundreds of villagers fled their homes to take refuge in safer environs with only a few of the brave choosing to stay behind. This is the sad plight of the villagers of Indigollewa, Yakawewa, Halmillawetiya, Thalgahawewa, Meegaswewa and Kalugahawewa for whom the nightmare of that tragic day is far from over. While government authorities as well as the military and police are trying to persuade the villagers to return to their homes, they are far from reassured. Today the area around the Kebitigollewa town is dotted with white tents to which mainly women and children have been confined while the majority of men who are employed in the home guard force are away on duty. The last time they fled their villages after a terrorist attack in the area in 1995, they remained displaced for over five years and it was only after the 2002 February Ceasefire Agreement (CFA) that many of the villagers returned home. J.Dhanapala of Halmillawetiya is one among the few still staying on in his village since that fateful day. Of the 86 families that resided there, only nine remain.” Seven people from our village died, some of who were my relatives. But I was born here and I have lived here thorough all the years of the conflict and I will not go now,” a defiant Mr.Dhanapala said. The terrorist attack has struck a severe blow to the economic conditions of the villagers many of whom are farmers. “We have no income at all since the attack. We cannot go to our paddy fields, we cannot go into the jungle to collect bees honey or sand, both of which gave us a good income. We are surviving on what we had collected before the attack,” he said. Several weeks before the attack on the bus, two of the villagers were shot dead by the LTTE and some of them had also seen foot prints which they believed belonged to LTTE cadres. “We asked for additional security and for the road to be cleared but nothing was done till the attack on the bus,” he lamented. The tragedy has affected the young and old alike. One and half month old Tharushi Kavinda was just 15 days old when the incident occurred. Blissfully unaware of the cruel goings on around her, Tharushi now sleeps on the ground with a tent to shelter her from the scorching sun. Her mother Swarnamala and grandmother are with her while her father who is a home guard is on duty in the village at Yakawewa which is now abandoned expect for policemen and home guards who have been assigned there on duty. “The security is inadequate for us to return to the village. There are no buses plying on the road and if a child falls sick, there is no way for us to come to the Kebitigollewa town after dark,” Swarnamala said. A single CTB bus started plying on the road last Wednesday, nearly a month after the attack, but many of the villagers are scared to travel on the same route although the sides of the road have been cleared by the army who also carry out a route clearing operations each morning. Today about 500 families live in five temporary shelters- including tents and a temple premise-close to the Kebitigollewa town.Less than 100 families remain in the six villages that were affected. Many have also moved into homes of relatives in safer areas. An official of the Divisional Secretariat in Kebitigollewa said the displaced are being provided with dry rations and security. However many of the displaced were worried that the lack of sanitary facilities and water shortage could lead to health hazzards if they had to stay in the tents for a long time. The Kebitigollewa Madya Maha Vidyalaya which was transformed into a massive funeral parlour to place the coffins of the bus attack victims is also slowly returning to normality with students trickling back to school since last Wednesday. Two students of the school were among those killed in the blast while another was injured. The displaced villagers who were staying in the school since the tragedy were last week moved into tents and other temporary shelters. The school reopened fully last Wednesday but the authorities are still facing the problem of accommodating about 400 additional students from Halmillawetiya School that closed after the attack. Kebitigollewa MMV principal W.S.Seneviratna said the displaced students would be admitted to the school but additional class rooms would be needed to accommodate them. “ We have adequate staff but we need more room for these students. We have about 50 students in each class at present so we cannot take in anymore,” Mr.Seveviratne said. He added that the Chief Minister of the North Central Province Bertie Premalal Dissanayake who visited the school on Wednesday had assured that a temporary building would be put up within two weeks to accommodate the displaced children. 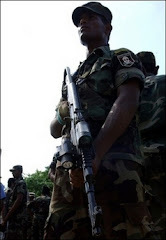 The villagers say if they are to return to their homes, a bunker line should be established along the area between the North Central Province and Mullaitivu- the area from where the terrorists infiltrate these villages. Director General of the Home Guard Force Rear Admiral Sarath Weerasekera said this would become a reality soon with the forward defense line in place and the strengthening of the home guard units. So while the government grapples with the task of reassuring the villagers to get them to return to their homes, the villagers watch and wait to see if the promises of strengthening security becomes a reality so that they can go back home.